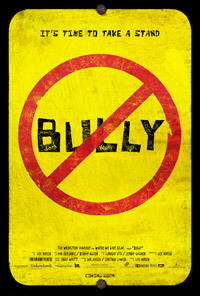 Bully Movie Trailer. Watch the movie trailer for The Weinstein Company’s documentary on school bullying. Sundance and Emmy-award winning filmmaker Lee Hirsch spent a year with families with children who have been bullied at school — teased, abused, humiliated and ostracized — behaviour which adults too often sweep aside with the cliche that kids will be kids. Directed by Sundance and Emmy-award winning filmmaker, Lee Hirsch, BULLY is a beautifully cinematic, character-driven documentary. At its heart are those with huge stakes in this issue whose stories each represent a different facet of America’s bullying crisis. BULLY follows five kids and families over the course of a school year. Stories include two families who have lost children to suicide and a mother awaiting the fate of her 14-year-old daughter who has been incarcerated after bringing a gun on her school bus. With an intimate glimpse into homes, classrooms, cafeterias and principals’ offices, the film offers insight into the often cruel world of the lives of bullied children.